In today’s busy life, we hardly get time to take proper care of our hair. Most women are so busy with working out and at home that they hardly get any time to look after their hair. Often your hair looks a mess and you hardly can do anything about it. Going to the parlour can be a luxury to most of us. However, you need not get disheartened. 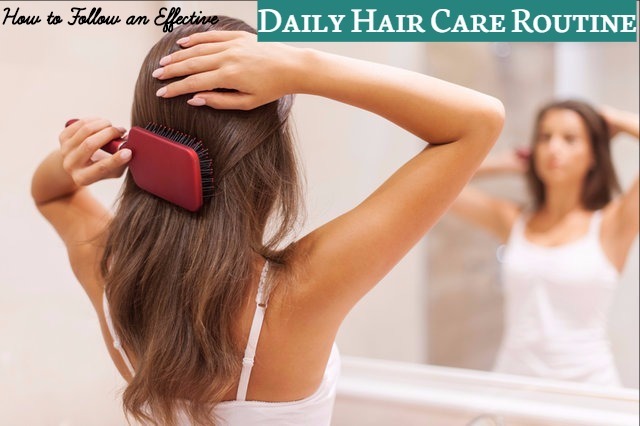 Here is a daily hair care routine that can help you get healthy and beautiful hair. You will get lustrous and healthy hair without the need to spend too much time on your hair by following this routine. Most of us brush our hair so that it remains tangle-free. What most of us do not know is that brushing can also help in distributing the natural oils evenly throughout our hair. As a result, you will get healthy as well as lustrous hair. Brush your hair gently using a soft bristled brush. Do not be in a hurry to brush your hair. Do it slowly. Pamper your hair. If you do not have time, you can brush your hair when you watch the TV. But make sure that you brush your hair and that too gently. If you brush your hair vigorously, it can break your hair and also scratch your scalp. Another thing to keep in mind is not to overdo the brushing. Be moderate and brush it properly. Never brush when your hair is wet, as it can break it. When you entangle your hair, start from the ends of your hair and then go towards the roots. Hair wash can differ from one person to the other. How often you wash your hair depends on the type of hair you have. If your hair is dry and coarse, you will have to wash your hair every second or third day. Fine and oily hair means that you will have to wash it everyday. If you have normal hair, you can wash it every other day. You can experiment with the schedule and note how your hair reacts to it. You can massage your scalp in small circular motions. This helps in stimulating the blood flow. If you have dry hair, use a hydrating shampoo to wash your hair. For fine and oily hair, clear shampoos are best. If you have normal hair, you can use any shampoo on your hair. Use any good quality shampoo for washing your hair. When you have dry hair you should use hydrating conditioner also. Apply it from the roots to the tips of your hair. This makes your hair look soft and glossy after you wash your hair. For fine and oily hair, use a light weight conditioner. Do not apply it near the roots of your hair. Apply it from the mid-length to the ends of your hair. For normal hair any good quality conditioner is enough. Apply it from the roots to the ends of your hair. You can distribute the conditioner uniformly on your hair by using your hands and a wide-toothed comb. Do not let the conditioner on your skin. This may cause acne. Try to use hair styling products as little as possible. If you are going to blow dry your hair to style, make sure that you use a heat protectant to protect your hair from the heat of the dryer. If you use hair styling products on you hair, try to avoid using them at least once a week to give your hair a chance to repair. When you use hair styling products, your hair is subjected to a lot of stress. Avoiding these products for a week gives your hair time to recover from the stress of using harmful products. You need to style your hair every day, whether you prefer an elaborate hair do or a simple one. When you handle your hair, make sure that you are gentle with your hair. Do not pull or tug your hair unnecessarily. Use your brush and style your hair carefully. Make your hair presentable so that everyone appreciates it. Before you go to sleep at night, spend some time on your hair. Stand in front of the mirror and brush your hair gently. This helps in getting rid of the knots on your hair. After you brush your hair, tie your hair into a loose ponytail. This will prevent your hair from getting tangled when you sleep. If you have short hair, you need not tie. Include healthy food in your daily diet like fruits and vegetables. Trim your hair regularly. This will avoid dry, damaged hair and split ends. Make sure that you do not over-wash your hair. Do not wash your hair with hot water as it can strip off the natural oils from your hair. It is better to let tour hair air dry. If you use a blow dryer, use one with a cooler setting. This is a daily natural care routine that is very simple. You can follow it easily without spending much time on your hair. You will not need to spend your hard earned money on visiting the hairdresser if you follow this routine. So, try it out and have shiny, healthy and lustrous hair.